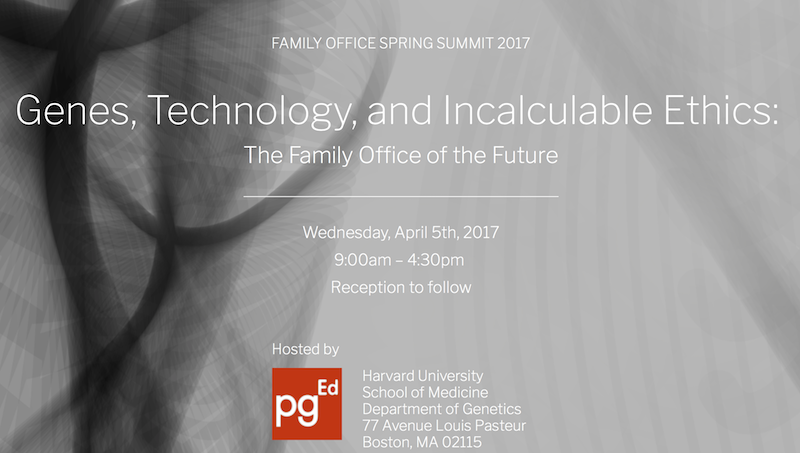 Asclepius Life Sciences Co-Hosts Harvard University School of Medicine Conference on 'Genes, Technology, and Incalculable Ethics - The Family Office of the Future' - Asclepius Life Sciences Fund, L.P.
April 5, 2017: Asclepius Life Sciences Fund, L.P. was proud to be a co-host of the Harvard University School of Medicine conference on ‘Genes, Technology, and Incalculable Ethics – The Family Office of the Future’. The conference explored “the intersection of the hugely accelerating genomics revolution and families of significant wealth”. “Our ability to sequence genomes, essentially identifying all components of our DNA, combined with big data analysis and technologies that will allow us to edit DNA, portend profound implications for generational health and well-being”, said the conference organizers. Michael J. Levas, Co-Founder, Senior Managing Principal and Chief Investment Officer noted his gratitude and admiration for Dr. Church’s vision, accomplishments and leadership. “It’s all too easy to dismiss the future. People confuse what’s impossible today with what’s impossible tomorrow.”-George Church, PH.D. Professor of Genetics, Harvard Medical School;Professor of Health Sciences and Technology at Harvard University and the Massachusetts Institute of Technology. Professor of Genetics, Harvard Medical School; Director, Consortium for Space Genetics, Harvard Medical School; Director and Co-Founder of the Personal Genetics Education Project. Clinical Professor of Psychiatry and Behavioral Sciences, University of Washington; Family Office Consultant, London, U.K. Professor of Genetics, Harvard Medical School; Chair, Department of Genetics, Harvard Medical School; Current research focus Evolutionary Biology. Professor of Genetics, Harvard Medical School; Current research focus Brain Development and Behavior.